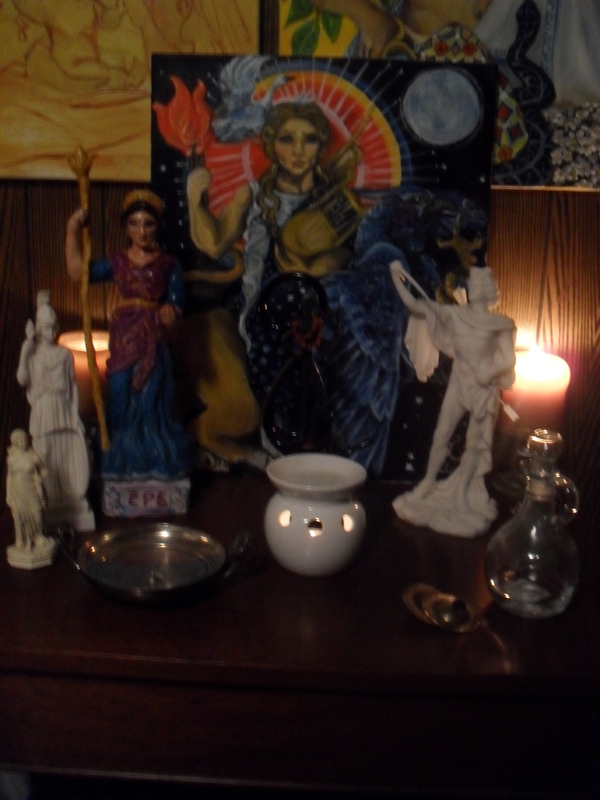 Today I celebrated part 2 of my autumn equinox ritual…the departure of Apollon to Hyperborea and the transference of power to Dionysos for the winter season. I know alot of people prefer to celebrate this during the Pyanepsia, but while Apollon is honored during this festival it is not really a festival for Apollon. It is a festival of Theseus in which Apollon is not a real participant aside from a thanksgiving in the part of the hero. In fact Pyanepsia is so closely enjoined with the myth of Dionysos and Ariadne that Apollon often appears barely visible at all in the festival aside from what basically is honorable mention for the assistance that was given. It is as the equinox itself that Apollon leaves, and Dionysos gains Delphi before he departs to the underworld (recalling that his grave was at Delphi) before arising, reborn, in the winter. I truly wish I had some image of Dionysos to make this festival truly feel complete, but that will have to be on my wishlist in time for the spring return of Apollon so I can have some company there for the Apollon statue. Of course I would love to get one sometime before winter..maybe a gift to myself for the holidays…for the manywinter festivals of Dionysos! In any case the autumn equinox is a pivital time of the year, the transference from summer into winter…a seasonal transference from which Apollon is inseperable if you closely regard the Orphic hymn to Apollon. Therefore I feel it is an important festival to not neglect in common with the festival for Persephone.. The very atmosphere of the ritual was quite static…as in I was tingly all over, especially on my hand as I saluted to the gods in my prayer. the feeling was quite different the more fuzzy feeling from the earlier festival, instead of being bittersweet it was charged with the movement of change. I especially felt this as I chimed the cymbals (small finger cymbals…I don’t have large cymbals and don’t think I would want to use those indoors, finger cymbals work perfectly for mypurposes) 12 times to greet Dionysos as I made my prayers to Apollon. Finally I sat the small iron statue of Apollon that was a gift while I had the occassion to visit Delphi, strung all around him the Baltic amber beads representing those tears which he had once shed according to myth in his first exile to the land of his mother, and this I placed upon a blue glass swan towards the end of the ritual as I bid him good journey. 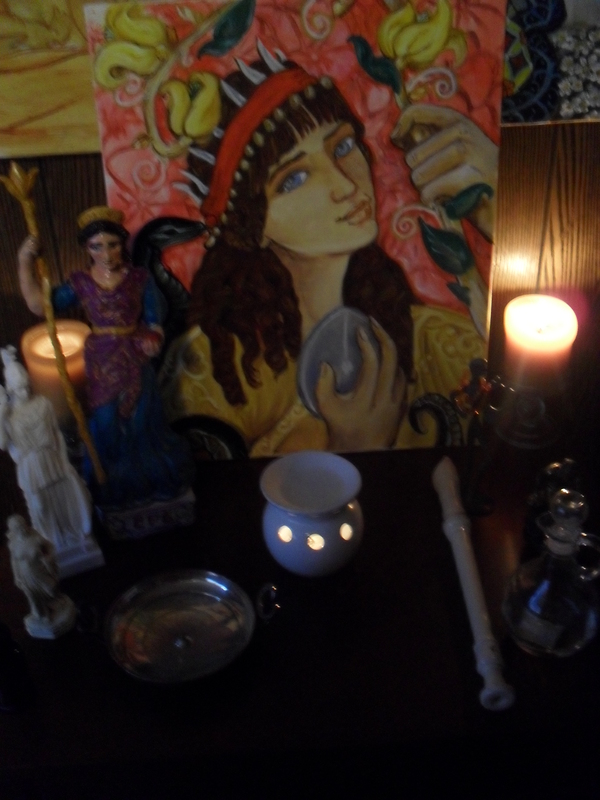 After this weekend his altar candle shall be encased in a lamp to represent his light shining from afar.